Top not-for-profit treasurer Sinead Glennon says treasurers must pay more attention to policies, risk management, cash management and planning, or they could be risking financial trouble. One of three major prize winners who collected $5000 each in last year's Commonwealth Bank Not-for-profit Treasurers' Awards, Ms Glennon based her entry on an online finance health check for groups, and it continues to benefit community treasurers today. The online survey by the Diploma of Business (Governance) student and treasurer for the Perth-based Genetic and Rare Disease Network (GaRDN) attracted 72 responses from across the country after ICDA shared the resource, revealing the strengths and weaknesses common to many groups. Some of the results from Sinead Glennon's finance health check should give treasurer's a reason to look more carefully at their policies. 16% said they didn't have the resources needed to complete a cashflow forecast. Ms Glennon says some of the results are worrying, especially if she is correct in her assumption that more conscientious treasurers had filled out the health check. She said having a good handle on cash, commitments and forecasts was crucial in enabling treasurers to see warning signs such as cashflow problems. And seeing these early warning signs would help organisations to avoid trading while insolvent, which is a duty of all community directors. 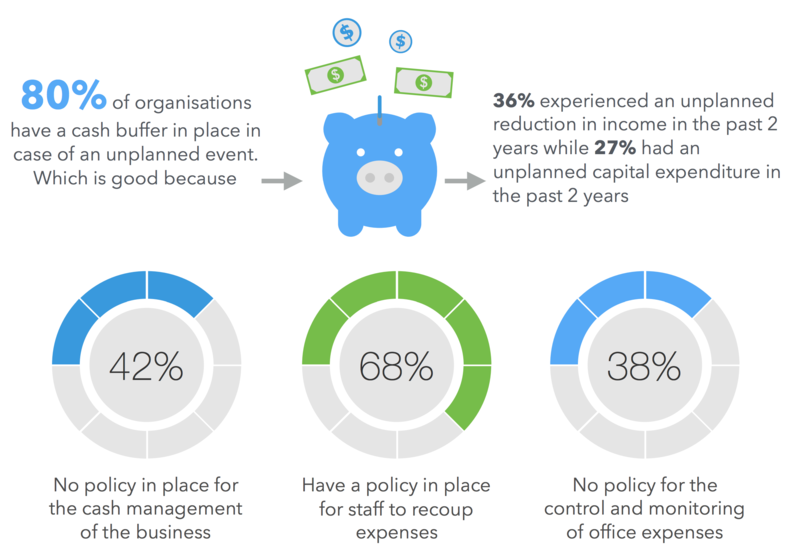 Similarly, having a contingency plan was critical for organisations, she said, especially with 36% having faced an unplanned drop in income and 27% having faced a sudden unexpected capital expenditure in the past two years. In her professional role as an accountant, Ms Glennon has been working with many organisations that are transitioning to the NDIS funding model, and she says financial scrutiny continues to increase across the sector. "It is a huge change in the funding model for a lot of organisations and it will lead to greater work, pressure and responsibility for the treasurer," she says. Ms Glennon says monitoring cash and working capital will become increasingly important in the new environment, with the new funding model seeing organisations paid in arrears, instead of the "block funding" of the past. "Board members, and treasurers especially, will need access to timely reporting and will need to understand the changing finances of the organisation." Overall, Ms Glennon says most respondents scored a pass mark of 63% on her health check survey, which assessed the health of organisations by examining their income, expenses, profitability, cash flow and liquidity. In most cases, treasurers had proper access to basic information such as income, expenses, a balance sheet, bank statements and the budget. She says she designed the survey to help new treasurers and those without accounting qualifications, which is why, for example, it avoids using complex financial ratios. The annual CommBank Not-for- Profit Treasurers' Awards, now in their fourth year, recognise community treasurers for all their hard work they do. You could win one of four $5000 donations for your not-for-profit or community group, either by nominating a not-for-profit or community treasurer you know and writing in 100 words or less why they should win; or by nominating yourself and telling us in 100 words or less why you should win. All not-for-profit treasurers nominated or entering will receive a certificate of appreciation. To enter and for more information, visit www.ourcommunity.com.au/treasurersawards2018. Entries close on Friday July 27.